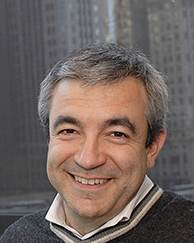 Luis Garicano is Visiting Professor of Economics at the University of Chicago Booth School of Business and Professor of Economics and Strategy at the London School of Economics. He was previously an Assistant, Associate and Full Professor of Economics and Strategy at Booth, and has held visiting positions at MIT’s Sloan School and at the London Business School. He is also a Research Fellow at the CEPR and an affiliate at the Center for Economic Performance. Garicano's research focuses on the determinants of economic performance at the firm and economy-wide levels, on the consequences of globalization and information technology for economic growth, inequality and productivity (see here for an overview), and on the architecture of institutions and economic systems to minimize incentive and bounded rationality problems (see here for an overview). His empirical and theoretical research has been published, among other journals, in the American Economic Review, the Journal of Political Economy, the Quarterly Journal of Economics, the Review of Economic Studies, the Journal of Economic Literature and the Journal of Economic Perspectives. In 2007, he received the Banco Herrero prize for the best economist in Spain under 40 years old. Garicano pursued undergraduate studies at the University of Valladolid, his home town, and earned degrees in Law and in Economics. He then obtained a Masters in European Economic Studies from the College of Europe in Belgium in 1992, and a Ph.D. in Economics from the University of Chicago. His main supervisor was the late Sherwin Rosen, and he was also helped by the late Gary S. Becker as well as by Kevin M. Murphy and Canice Prendergast. Apart from his academic research, over the last few years Garicano worked on policy issues related to the Euro crisis. He coauthored a document on a Eurobond proposal (a summary can be found here in the WSJ). He also worked on policy issues involving the Spanish post bubble economy, where he has undertaken applied, policy relevant research, on the economic reforms necessary in Spain, producing documents among others on the Spanish Savings Banks, the Spanish labor market, the productivity of the Spanish economy, and the reforms required to adjust the health and pensions systems to the demographic changes that Spain is experiencing. Much of this work is summarized in the book, "El dilema de España" which has reached the top of the non fiction lists. He was the co-founder (and an editor until August 2013) of Nadaesgratis, the leading blog in Spanish on economic affairs. He tweets occasionally on Spanish issues (in Spanish!) as @lugaricano. Since 2015, Garicano has been the main economic adviser, in charge of the Economic, Knowledge and Employment Policy at Ciudadanos, a party that is now in Parliament with 32 seats. His work on this program is summarized in Recuperar el Futuro with Toni Roldán, who is the Speaker on Economic Affairs of Ciudadanos. In December 2016, Garicano was named Vice President of the European Alliance of Liberal Democratic Parties (ALDE). Cooking, reading (particularly biographies), hiking. Economics of acquisition and transmission of knowledge; organizing professional service firms; specialization; culture, language and codes in organizations; incentives; organization and strategy. We analyze empirically the allocation of rights and monetary incentives in automobile franchise contracts. All of these contracts substantially restrict the decision rights of dealers and grant manufacturers extensive rights to specify and enforce dealers' duties. The allocation of decision rights and incentive intensity differs across brands, however. This variation is explained by the incidence of moral hazard. In particular, when the cost of dealer moral hazard is higher and the risk of manufacturer opportunism is lower, manufacturers hold more rights to determine the performance required from their dealers and to use mechanisms such as monitoring, termination and monetary incentives to ensure that such performance is provided. This article illustrates how contracts are completed ex post in practice and, in so doing, indirectly suggests what the real function of contracts may be. Our evidence comes from the contracts between automobile manufacturers and their dealers in 23 dealership networks in Spain. Franchising dominates automobile distribution because of the need to decentralize pricing and control of service decisions. It motivates local managers to undertake these activities at minimum cost for the manufacturer. However, it creates incentive conflicts, both between manufacturers and dealers and among dealers themselves, concerning the level of sales and service provided. It also holds potential for expropriation of specific investments. Contracts deal with these conflicts by restricting dealers' decision rights and granting manufacturers extensive completion, monitoring and enforcement powers. The main mechanism that may prevent abuse of these powers is the manufacturers' reputational capital. By allowing networks to split, decentralized blockchain platforms protect members against hold up, but hinder coordination, given that adaptation decisions are ultimately decentralized. The current solutions to improve coordination, based on “premining” cryptocoins, taxing members and incentivizing developers, are insufficient. For blockchain to fulfill its promise and out-compete centralized firms, it needs to develop new forms of “soft” decentralized governance (anarchic, aristocratic, democratic, and autocratic) that allow networks to avoid bad equilibria. We propose a simple model of the sovereign-bank diabolic loop, and establish four results. First, the diabolic loop can be avoided by restricting banks’ domestic sovereign exposures relative to their equity. Second, equity requirements can be lowered if banks only hold senior domestic sovereign debt. Third, such requirements shrink even further if banks only hold the senior tranche of an internationally diversified sovereign portfolio – known as ESBies in the euro-area context. Finally, ESBies generate more safe assets than domestic debt tranching alone; and, insofar as the diabolic loop is defused, the junior tranche generated by the securitization is itself risk-free. This paper examines hierarchies' role in the organization of human-capital-intensive production. We develop an equilibrium model of hierarchical organization, then provide empirical evidence using confidential data on thousands of law offices from the 1992 Census of Services. We show how the equilibrium assignment of individuals to hierarchical positions varies with the degree to which their human capital is field-specialized; then show how this equilibrium changes with the extent of the market.